Performs well Depends on if you love purple or not! The RHM2064P is one of very few purple microwaves on the market - it features an almost identical specification to the majority of similar priced microwaves (20 litres, 800w, solo microwave), and the one thing that makes it stand out is the colour - a deep purple. 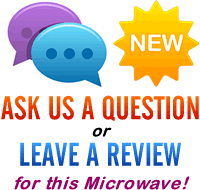 We've already reviewed this microwave in red - this is identical in every way, except for the colour. It features a digital timer, clear controls and a mirrored finish to the door. We won't go into too much depth in this Russell Hobbs RHM2064P review simply as we've covered it before. To summarise: it looks pretty good, works well and will suit any purple themed kitchen. If you have a purple toaster and kettle set, and you're after a purple microwave to match, then the RHM2064P is worth considering. A reliable Russell Hobbs microwave, finished in purple. 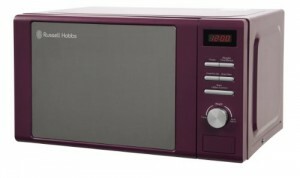 If purple's your colour, and you need a microwave, then this model is worth considering.